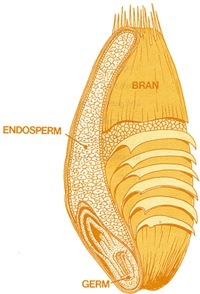 In short, it's the whole grain: germ, bran, and endosperm. But what is a grain? The edible fruit/seed of a cereal or grass plant. Though grains are always seeds, seeds are not always grains (think sesame or poppy), and obviously not all grains — sand, truth — are edible (or easy to digest, I should say). Strictly speaking, some grains that we call grains are not true grains, like quinoa, which is actually a pseudocereal (because it's not a grass). Beware of tricky names, especially when it comes to wheat. Did you know that buckwheat is not a wheat? It's not even a cereal, for that matter, but a member of a flowering plant in the same family as rhubarb. Spelt, on the other hand, is a kind of wheat, a mild-flavored ancient strain. Confusing, I know. Botanical classifications aside, for the purposes of this challenge whole grains are unrefined, minimally processed, edible seeds. Intact, whole grains are excellent sources of fiber, vitamins, minerals, and protein. What am I hoping to gain by eating more whole grains? A diet based on more plants, less meat. Lower cholesterol. A colon that runs like the Tokyo underground. Good health through good eating.